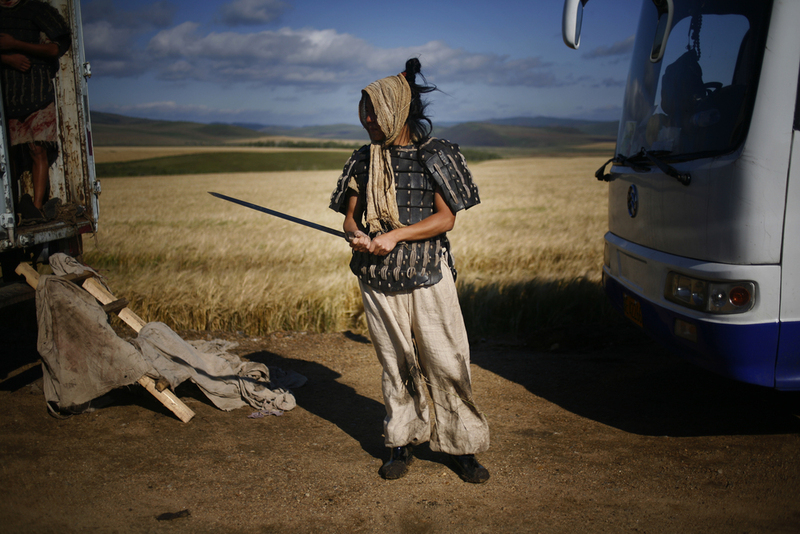 ​A crew member of a Chinese movie set walks down an on-location set in the early morning. ​Extras practice a scene on location. ​A crew member cleans up the set between takes. ​Crew members work to create a scene in a sound stage. ​Cast and crew members on break. ​An extra waits for makeup and costume change. ​Extras holding down their position in preparation for filming. ​An actress during a shooting break. An actor smokes a cigarette while receiving finishing touches on hair and makeup. ​Extras exploring a sound stage. ​An extra waits on a bus during a break. ​A passerby observes a location set. Shooting in a wheat field near the China-Russian boarder.